Nuclear medicine has been around since the late 1940’s, and although it is a major branch of Diagnostic Medical Imaging it takes everything we know as radiology and turns it upside-down. Unlike conventional radiology which uses an outside source to emit radiation and then records how much of that radiation the body absorbs (the way that a photo camera uses light), nuclear medicine uses the patient as the source of the radiation emitting from inside the body. Although we all have some naturally occurring radioactive substances in our bodies, nuclear testing uses highly specialized radioactive tracers known as radiopharmaceuticals specifically designed to attach themselves to particular cellular receptors or the cells of a specific organ. This allows the imaging to focus on a particular type of tissue throughout the whole body, rather than a particular body region. This makes it an invaluable tool in showing early signs of widespread problems like metastatic cancer. Patients are given radiopharmaceuticals either intravenously or orally. Then a highly specialized gamma camera takes real-time images of the body. So, unlike most other tests, nuclear medicine shows the physiology of an organ (how it functions), rather than the anatomy (physical mapping) of it. 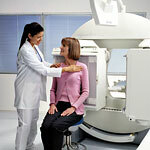 The nuclear medicine tests are performed on the Siemens E.Cam Duel, the most popular gamma camera in the world. It has an open design to ease the process for patients in wheelchairs, on stretchers or for those suffering from claustrophobia. Like all other testing involving radiation, nuclear medicine testing should be done cautiously and only when necessary. That being said, the benefits that nuclear medicine provides in early diagnosis far outweigh the risks in radiation exposure. Your doctor can tell you more about the risks and benefits of the particular procedure that you are being prescribed.